This is a continuous ECG tracing from a patient with sick sinus syndrome who Complained of palpitations and near syncope. 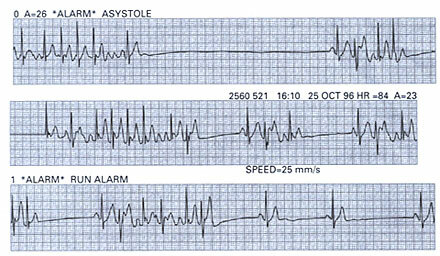 The patient was mostly symptomatic from the pauses following abrupt termnination of his atrial fibrillation. Note the frequent abrupt terminations, followed by pauses up to 6 s before resumption of atrial fibrillation.